I have new hair. 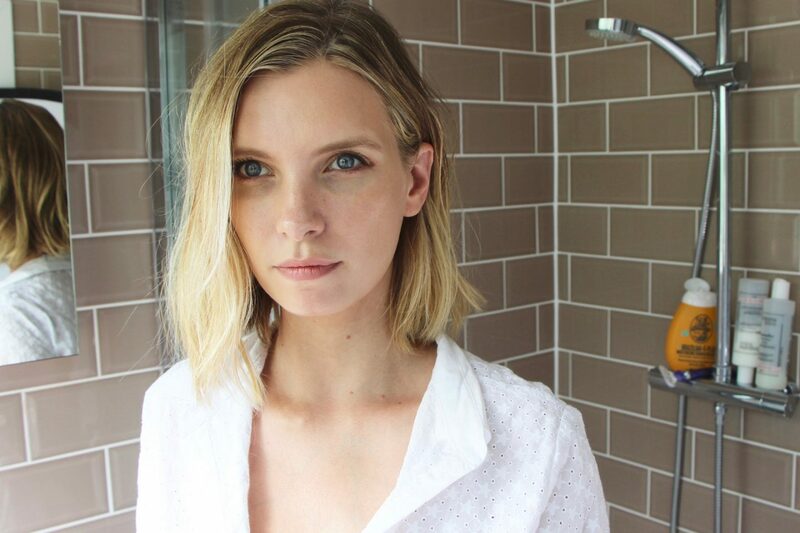 Please excuse the fact that I’ve taken these photos with my shower in the background – I was filming a video in the bathroom and the light was nice! If you like the style and want to copy it, then that’s your blueprint. Of course, you could go to Melanie and Kat themselves…and one of you might just have that opportunity in the near future. That’s all I’m saying for now – watch this space! This was just the hair-perk-up I needed because I’ve been losing quite a bit of it recently – it happened after I had Angelica too. I didn’t want to keep tying it back, because I have two little bald patches at my temples, but I was getting hot and irritable with it down. I didn’t go to my appointment thinking I’d go much shorter, so it was on a bit of a whim! Doing things to my hair “on a whim” is still something of a novelty. It has taken me quite a few years to become accustomed to the fact that I am now in sole charge of what happens to my hair, because for most of my full time modelling years (let’s say from 2002-2012), my hair colour and cut was almost always dictated by the jobs that I did. When it came to paid hair jobs, quite often they would want to clart around with my barnet – make their mark. My agency, Models 1, were always excellent at laying down the law with clients about my hair – any changes that people wanted to make had to be agreed before the job, and were often written into the contract. If it was a small hair job, the client would only be allowed to trim my hair and touch up the roots – if it was a big advertising job then quite often they had permission to do more drastic things. But the problem with any job where they were allowed to do stuff to my hair was this: one person’s idea of a trim, as we all know if we have ever been in a hairdresser’s chair ever, is completely different to the next person’s idea of a trim. The number of times I came away from a “quick trim” having been virtually buzz-cut wasn’t even funny, and there was one particular TV commercial where a “shoulder length” cut turned into a jaw length bob. In all fairness, most clients were very keen to make sure that I was happy with what they wanted to do – I don’t want to give the impression that my head was completely hijacked. But even the best intentions were often lost in translation, and people did tend to be quite scissor happy in the fashion industry! In the end, it was all so stressful that I just learnt to detach myself from my hair completely – I thought of it as a sort of removable wig, part of my wardrobe. If someone botched my colour (bright, custard yellow highlights, New York, 2011) then I tried to comfort myself with the knowledge that it could be corrected. If my long, shiny locks were chopped into a dodgy mullet (Amsterdam, stoned hairdresser, 2002) then I had a bit of a cry and, on the next job with a decent stylist, I’d get it re-cut and corrected. Needless to say my hair spent a lot of time getting blonder and shorter. In fact, six months before my wedding, I ended up with hair so short it was shaved at the nape of my neck. It was so white blonde that only two days after a bleach touch-up, my scalp would look as though it was covered in tens of thousands of tiny black fleas or nits where the roots were peeking through. Looked great, actually and I had thought that it was quite exciting at the time, but you get the idea: my hair was never my own. Hair jobs were a good source of income and so I used to suffer the bad cuts and colour jobs, but boy was I glad when I no longer needed to say yes to them! 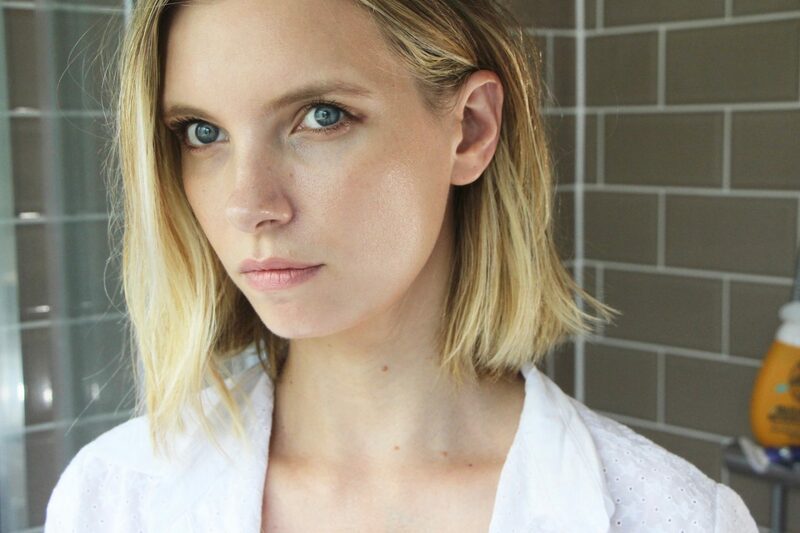 My last ever hair job as a full-time model was possibly the absolute pinnacle in terms of ridiculous, soul-destroying hair situations; they cut five inches from the length, hacked some layers in, dyed it a weird, brassy shade of blonde and then on the shoot day decided they preferred me in a wig. Yes, readers: on top of my new, horrendous style, I wore a wig. Anyway, I didn’t set out to have a moan about my modelling days – I had a fabulous time, what a way to spend your twenties! – but I do now rejoice in the fact that I have full control over my hair. When I go shorter, it’s because I want to. When I go blonder, or darker, it’s not because someone has botched my colour, or because it will look better in a picture, it’s because I fancy a change. Now and then I do take on a hair job, like the good old days, but I tend to have more of a say. It’s all my own hair, little bald patches and all. Now: I’d like your hair anecdotes in the comments section, please: disasters, emergencies, disagreements that ended with fisticuffs at dawn… Tell me all. Any bad hair modelling stories, models out there? If you make me laugh enough, I’ll go into my office and dig out some of the worst pictures from my modelling past. Maybe I’ll put them into a video slideshow. How very 2004! HUGE Announcement: Colab with Little Mix!